This malt has been a real challenge. I’ve tried to make it 10 times varying the process each time. My goal has been to make a malt that tastes like Honey malt. So far I’ve come close but not close enough. I wanted to re-do this one as well because a few people had asked me and I was wondering myself, what the difference was between Brumalt and a dark Munich or Aromatic malt. I don’t have much information on Brumalt in the textbooks that I have so I’ve been doing this mostly by trial and error. I’ve been measuring my results with store bought malts (Honey and melanoidin) comparing pH, colour, extract and flavour. As you may know Honey malt is made by the Gambrinus malting company right here in my home province of British Columbia Canada so I had to ask if they would give me any information on how it’s made. They wouldn’t of course, the recipe is a closely guarded secret but they were nice enough to give me a tour of the plant which you can see here. Like the name says it tastes like honey but it’s a dark honey flavour and has an almost wine-like fermented quality to it. 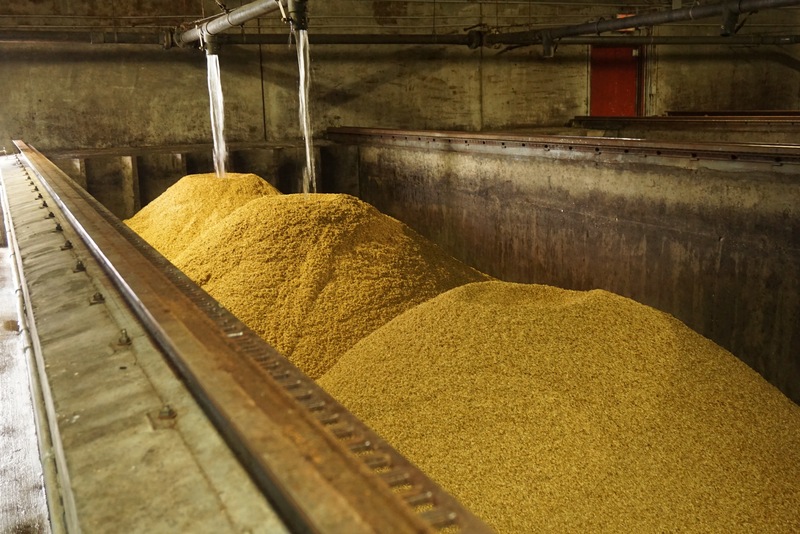 Barley recently emptied from the steep tank to a Saladin box at Gambrinus Malting Ltd. The first thing I noticed when comparing malts is that store bought melanoidin and Honey malt have a lower pH than Aromatic malt or a Munich of a similar Lovibond. So what causes this low pH if it’s not the colour? According to the descriptions I’ve read, after a 6 day germination the green brumalt is piled up and covered with a tarpaulin or if it’s made in a box system all ventillation is cut off and the malt heats up to as much as 50C due to respiration, usually within 24 hours. (Munich is only allowed to reach 25 C). Once enough carbon dioxide builds up the malt stops growing and cools down but the enzymes continue to develop which create a malt with a lot of “low molecular weight sugars and amino acids” (Kunze 2004 p.180) In Malts and Malting, Briggs states that this phase lasts 30-40 hours (Briggs 1998 p. 714) Kunze states 36 hours. In Jean DeClercks A Textbook of Brewing he describes the practice of “Thickening the Piece” “…used for the preparation of malts with a rich aroma. It simply consists of making the piece into a thick heap on the last two days of flooring. The temperature rises to 50C and enzymatic activity becomes very intense. Pre-formed sugars are formed in large amounts and there is considerable proteolysis.” (DeClerck 1957 p.177) Something else jumped out at me in the DeClerck text when he described an investigation carried out by Luers and Gottschneider on the effects of different proportions of CO2 on malting. With 20% CO2 in the air during germination the presence of ethanol was detected. (DeClerck 1957 p 175) Is this why I’m detecting a wine-like fermented flavour and aroma from Honey malt? A while ago I made an acid malt by placing green malt into a sealed ziploc bag keeping it warm at 35-40C for 36 hours. The ideal environment to promote the growth of Lactobacillus bacteria which is naturally present on the husks, is at 37C in an anaerobic environment. So it makes sense that some amount of acidification is happening during this couching phase of the brumalt process. In order to mimic these natural occurrences on a small scale I had to enclose the malt in a ziploc bag to seal out the oxygen. I then added some heat to keep the temperature at 37C This worked well and I was able to get a malt with the pH at the same level as Honey malt after 16 hours at 37C before raising the temperature to 50C to stew. But I wanted to see if I could make it in a way that was closer to the descriptions. I tried it once in a small cooler loosely covered and the temperature rose to 42C due to respiration, but it took three days and I was concerned that the malt would overgrow. When this happens the malt will taste bitter and sprouty. I then bagged the grain for a period to acidify it just like before but this time it didn’t work. After kilning the pH was not lower, I thought that perhaps the hot couching may have killed off the bacteria. Honey malt left, my brumalt center, batch #7 on right. 18 hr stew at 50C vs 8 hr. 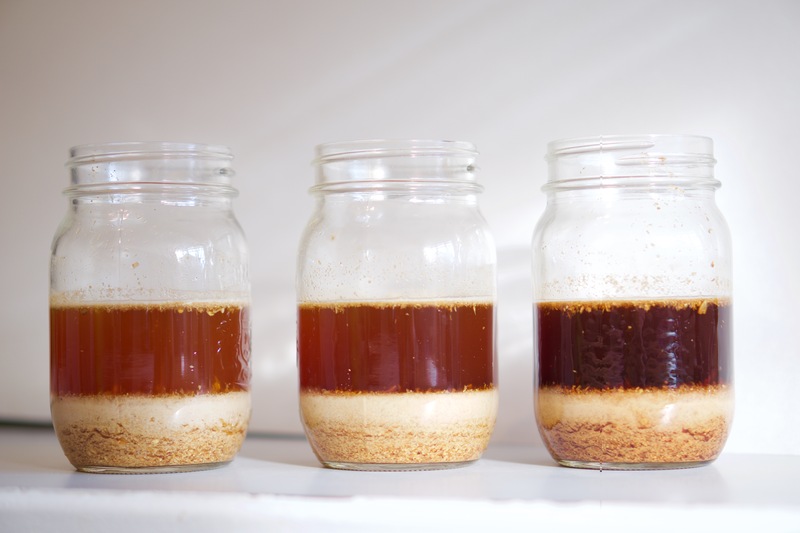 PH is also affected by colour of course, generally speaking the darker the malt the lower the pH, but a characteristic of Honey malt is that it lacks the roasted or toasty flavours you would get from a dark malt due to the lower curing temperature. The colour comes from the melanoidins developed during stewing. When you add a stewing phase at 50C 122F proteolytic enzymes break down the proteins into sugars and amino acids which when combined with heat in a moist environment create melanoidins which give you malty flavours and colour. 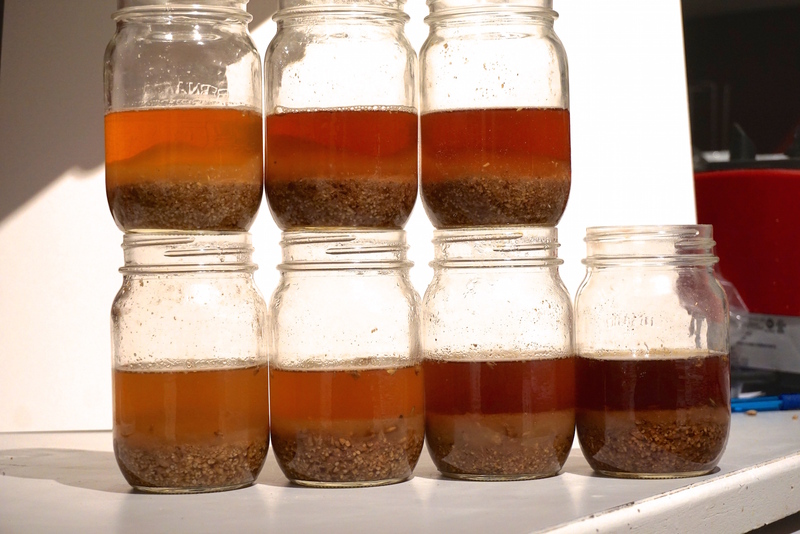 You can control the amount of colour by varying the time your malt spends at this stewing phase. After experimenting I found that 8 hours at 50C will give me a colour around 25-30 L, similar to Honey malt. Of course that will vary with the barley used and the amount of protein in the grain. Roasted malts on the other hand which are created when the malt is dry and at a higher temperature will give you more roasted flavours, sort of like the formation of toast vs. bread crust. 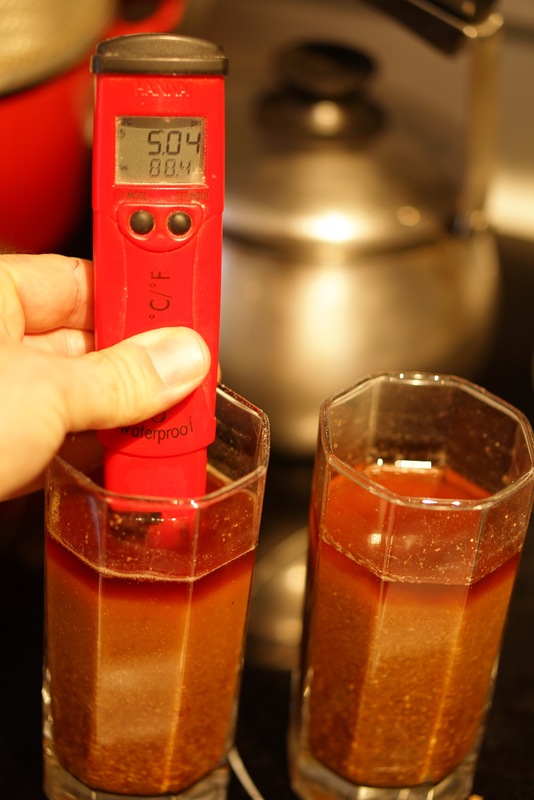 Comparing pH of my brumalt to Honey malt – just pure luck that they’re exactly the same, other batches are not. One test that I’ve been using to compare malts is meant to measure the soluble sugar and extract potential (sort of). It’s not a scientific test and not very consistent but since it’s just comparative it does give some insight as to how a malt is made. I’ve been using this test because it’s quick. A measured amount of grain (1.6 oz) is weighed and crushed and mixed with 250 mL of boiling water. The use of boiling water was meant to inactivate the enzymes but since the temperature of the water drops as it’s added to the sample some of the enzymes survive and end up converting some of the starches.The sample is allowed to settle and cool and then is measured with a refractometer. In a true cold water extract test the water is mixed with a solution of ammonia to inactivate the enzymes. Cold water extracts are used to measure the amount of soluble sugars or “pre-formed sugars” there are, which tells you how well modified a malt is, the higher the number the more thorough the modification. The results that I’ve gotten just using boiling water are quite telling. Honey malt gets a very high brix number similar to a pale malt that I made. My Brumalt was a close second, Munich scored lower and caramel malt scores very low. So since this test is actually showing us the diastatic power or even the extract potential it would lead me to believe that honey malt is kilned at lower temperature than Munich. Keeping the kilning temperature below 50C until the moisture content is below 10% will not destroy as many enzymes. 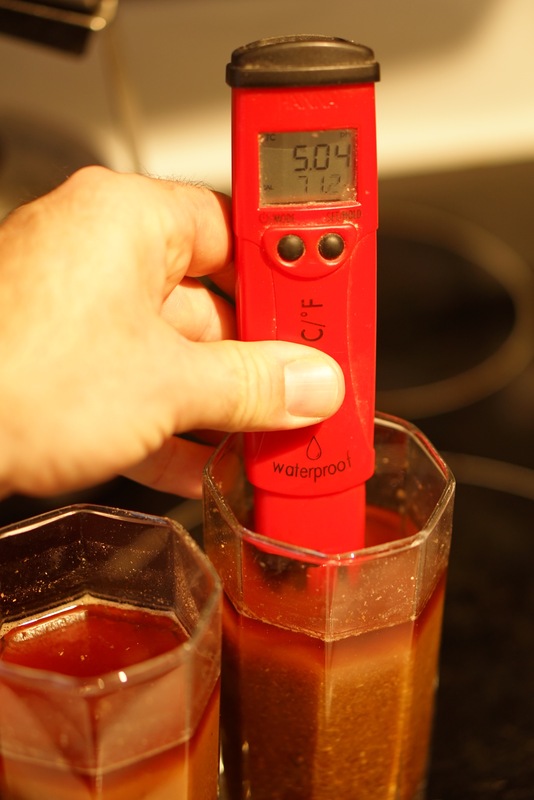 In a true hot water extract test the malt is mashed according to a very specific schedule and what you find out is the potential extract of a malt. I tried my own version of this test as well with small 50g samples comparing Honey malt, Munich 30L, Aromatic, Melanoidin and my own. Although my test was crudely done Honey malt still came out on top with the highest brix reading, mine was still second. Germination temperatures, 1. warm throughout, 2. warm during the last 3 days and 3. warm for the last day only. Warm germination temperatures during the final phase of germination promote the development of proteolytic enzymes, the enzymes which act on proteins. From what I’ve read the longer the germination the more enzymes will develop and to have a long germination the temperature must be kept at 13C or 55F. The warmer the germination the faster the grain grows. What seems to work best (for my barley) is 6 days at 13 then a day at 22C. Couching, I’ve tried a few different lengths of time to get a lower pH and determined that with my barley, 16 hours at 37C with a shorter rest at 50C for 8 hrs, both in a sealed ziploc bag and low kilning temperatures gives me the same pH and colour. High kilning- raising the temperature to 60C while there is still 25-30% moisture. Usually done with Munich malt for maltier flavour and for colour, this will lower the diastatic power of the malt. I don’t seem to be having any problems achieving colour with kilning temperatures below 50C, the amount of colour is dependant of the length of time it spends stewing at 50C. This could be an indicator of a high level of protein in my barley. So I settled on using low kilning temperatures to maintain the enzymatic power as much as possible. As well I’ve also tried different curing temperatures and I’ve found to minimize the roasty character the curing temperature must be kept below 200F. The biggest changes in colour and pH occur during the curing phase, a half hour can make a huge difference. This will give you a sweet yet sour malt (low pH) that’s around 30L and maintains it’s diastatic power. 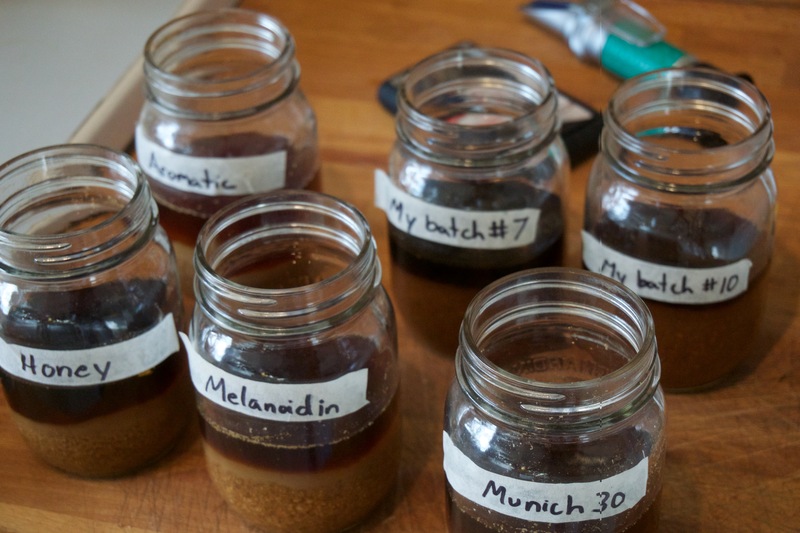 Munich light 5-7L , Munich dark 8-10L, darker Munichs, Munich Wheat, Aromatic 20-26L, Melanoidin 23-31, Honey 25L and Brumalt. Here’s a group of malts that probably deserve their own category. They are sometimes referred to as “high kilned” malts and in some old text books they’re referred to simply as “darker malts” which can be confusing because they’re not necessarily referring to dark roasted malts like chocolate malt. They’re referring to Munich, Aromatic and Melanoidin malt. 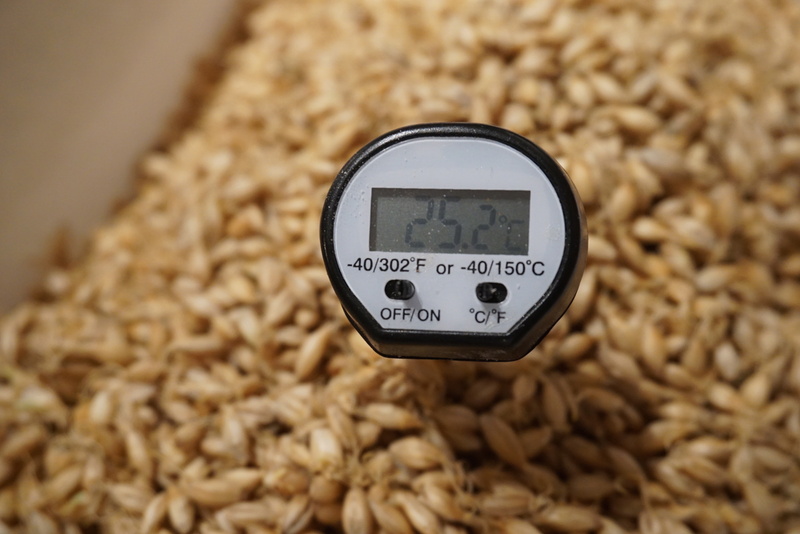 These malts differ from pale and lager malt in that they have a higher initial moisture content (resulting in higher modification), they’re germinated at warmer temperatures and they’re kilned differently- warmer sooner and at certain points without ventilation. 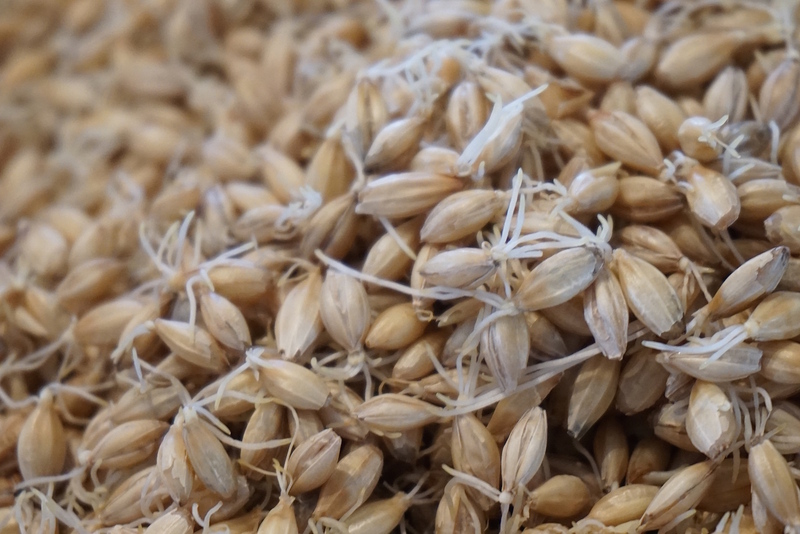 The goal when making these malts is to produce a rich malt with a strong aroma. Different companies have slightly different schedules but they all have the same objective- to produce melanoidins. Melanoidins are reddish-brown coloured substances which contribute the characteristic rich bready, malty aroma and flavour. These are also what give bread crust it’s colour and flavour and are produced as a result of Maillard reactions. Maillard reactions occur in all malts to a certain degree (except in air dried “wind” malt). However, in other malts like biscuit for example they occur when the malt is in a dry state. In these “melanoidin” malts it occurs when the malt is still moist. Using the bread analogy again, a breads crust is formed in the oven from the wet dough, as it cooks. The crust has it’s own unique flavour. Whereas, if you toasted a slice of that cooked bread you would get browning but with a different flavour, a toast flavour. Actually each step in the production of these malts promotes these reactions. Firstly they are steeped until they have a moisture content of 45-48%. 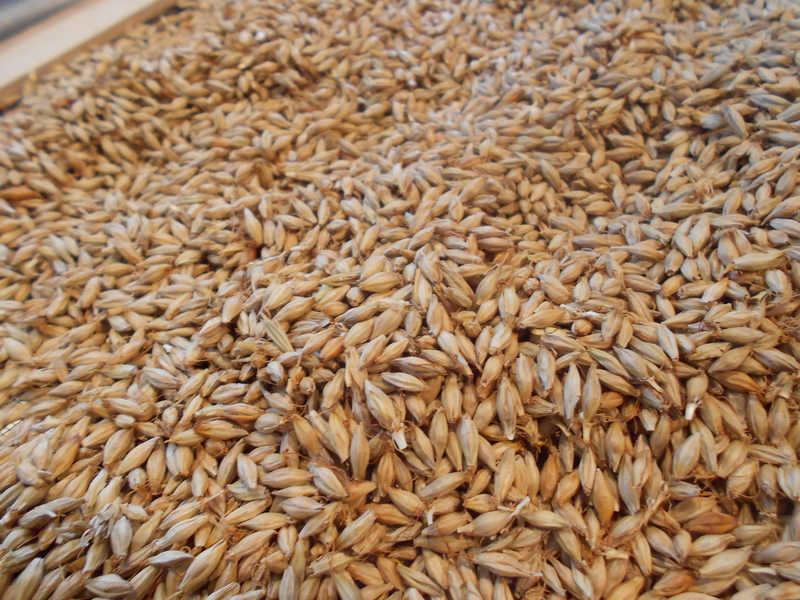 During germination the malt is allowed to reach 20-25 C as opposed to 15-18 C for pale and lager malt. These higher temperatures promote the development of proteolytic enzymes, the enzymes which act on protein.The protein in the malt is then degraded during the higher initial kilning at 50C or 122 F into peptides, polypeptides and amino acids. This is done while the grain still contains moisture and is akin to the idea of stewing for crystal malt only at the “protein rest” temperature range to target the action of these enzymes. There is also the formation of sugars occurring during the malting process (aided by the high modification) and when combined with amino acids and heated produce Mellanoidins. This is what’s called the Maillard reaction named after the French chemist who discovered this. For this batch of Munich I did things a little differently. Firstly I germinated warm, 16 C for the first day just because there was a lot of surface moisture and I wanted that to dry out or be absorbed before bringing it inside. Day 2-5 was done at room temperature. It really took off at day 3 and on day 5 the tray, which was only about 4 inches deep reached 25 C (77 F). What I should have done at this point was spread it out and give it another day at least to let the enzymes develop, but I was impatient and the interior of the grain was easily smooshed between my fingers indicating that it was well modified. 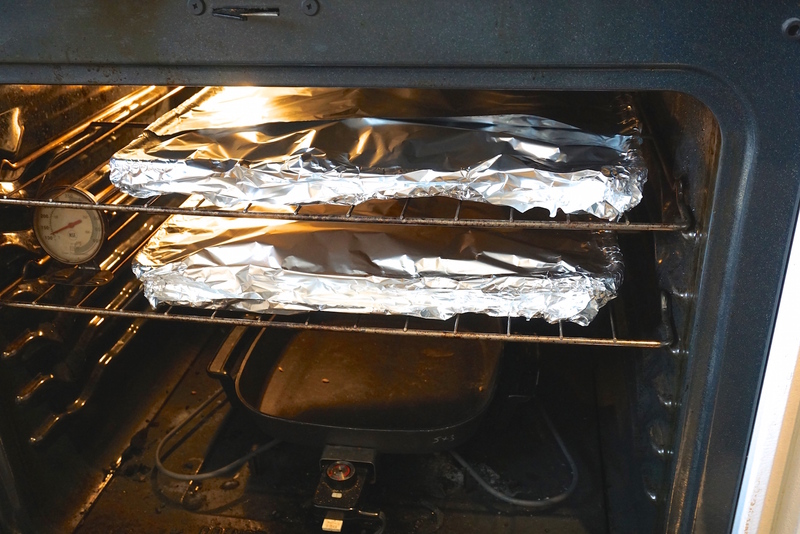 Next 18 hours were at 50 C (122 F) on trays under tin foil in the oven. I figured trays would be better than a big pot for consistency of heat. I noticed with the caramel, the malt closest to the sides of the pot were warmer for quite some time. After 18 hours the moisture content only dropped 10% to 38%. Took my first sample of Munich. I then increased the temperature again to 225 F (107 C) and took a sample every thirty minutes 3 times. What you may not be able to see in the photos is that the first sample is actually a little lighter than the store bought Munich 10, so it’s probably 7-8L. The second sample is just a bit darker than the Munich 10, call it 12-15L. The third sample is close to the Munich 30-35. The fourth is a deep reddish brown but I don’t have a malt to compare it to. To get a lighter Munich just cure for 1 hour at 210F (99 C) and not 2 hours. I tasted all of these samples and my samples tasted very similar to the two store bought ones. The dark one was nice and roasty. The Honey malt was quite distinct and I thought I could detect some lacto sourness to it. So I took the pH of each and the Honey was much lower than all of them at 5.12. This makes sense since it most likely went through the couching phase without oxygen at warm temperatures which would promote the growth of lactobacillus bacteria. I’ll have to do some experimenting with this – it’s on the list! Here’s a real unique malt that I’m definitely going to use a lot more of in my brews. Brumalt, Melanoidin malt and Honey malt are from my understanding the same thing give or take a few degrees in colour. Honey malt is the proprietary name for a melanoidin malt produced by the Gambrinus malting company here in British Columbia, Canada. Update: Although Gambrinus has referred to Honey malt as their version of a Brumalt and Brumalt and Melanoidin malt are often referred to as the same thing, (Wolfgang Kunze pg. 180 Technology Brewing and Malting, John Mallet pg. 119 Malt) it should be pointed out that Honey malt has it’s own unique flavour that is different than Melanoidin malt. As I am not entirely sure what the process is for making Honey malt it should not be regarded as being interchangeable with melanoidin malt. I couldn’t find much information on the actual malting procedure, but I found enough to make a malt that is very sweet and extra malty in flavour. When it was kilning the aroma filled the house with something similar to dark toast with honey and perfectly roasted marshmallows. What info I did find is posted in the Information on malting section of this blog and one or two sentences in Malting and Brewing Science (authors listed in the info section). A few questions still remain, however, since I have never actually seen this malt being produced and they have to do with the final phase of germination. If you watch the video you can see that by the end of the germination I had so much root growth that the malt formed a solid mass. Was this too much growth? Perhaps I should have covered it better to really deplete the oxygen. Was 36 hrs too long before raising the temperature? and how do they get it so hot anyway? Pot warmed in the oven (with a hotplate) to 45-50C for 18 hrs. Finally cured at 96C 205F for 3 hrs.